An easy and tasty spin on an original pizza. 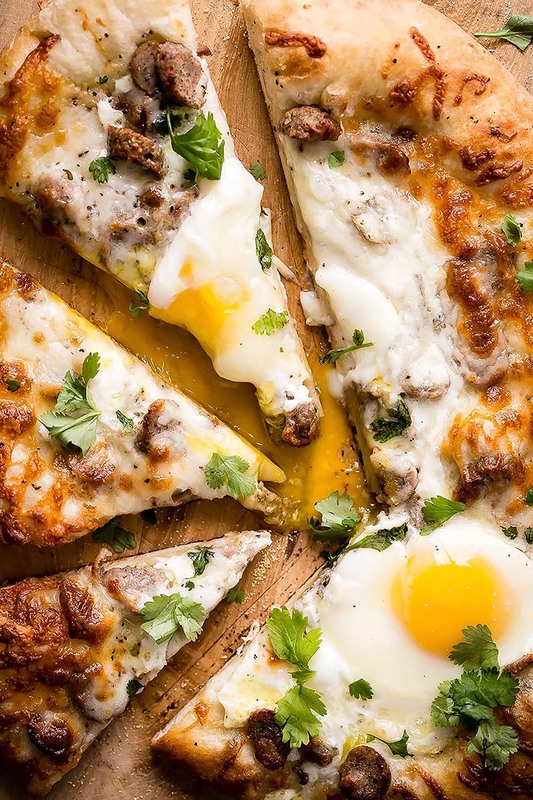 Sausage, egg and melted cheese on top of the best pizza dough. Make this for brunch or breakfast and add fresh cilantro. Mix the yeast with the water in the bowl of a stand mixer and let sit for 5 minutes. Add the flour and salt and mix with a dough hook attachment until all of the dough comes together in a ball. Continue to mix for about 5 minutes on low speed. Wipe the inside of a bowl with 1 tablespoon of olive oil. Take the dough and roughly form it into a ball placing it into the oiled bowl, turning it to coat all sides. Cover with a towel and let the dough rise for about 1 hour or until almost doubled in size. After the dough has risen, transfer it to a floured work surface and punch the air out of it. Roll the dough into a circle or rectangle shape depending on your baking stone or tray. Sprinkle the cornmeal onto your pizza peel and transfer the dough onto it. Cover the dough again and let rest for another 30 minutes. Drizzle the remaining olive oil all over the pizza and scatter the sausage slices onto the pizza. Cover with the grated cheese and slide dough onto your stone. Cook for about 4-5 minutes until the cheese starts to melt and the edges of the dough start to puff up. Carefully crack two eggs on top of the pizza and close the grill. Bake the pizza for another 4-5 minutes or until the cheese is bubbling and golden and the eggs have firm whites and a soft yolk. Take the pizza from the grill stone and garnish with some chopped cilantro. Slice into wedges and serve immediately. If you don't have a grill or a pizza baking stone, you can use your oven and a regular baking tray. Make sure your oven is at the highest heat it can go to, usually around 500-550°F.